Euchre is very popular in Muirfield! As many of you know, there is a euchre group that meets once a month, usually the second Friday of each month. This group, which is hosted and organized by Jackie Miller, is full. Due to the popularity of that group, LuAnn Albert would like to form a second group. This group will most likely meet every third Friday around 7 p.m. at her home. The group would rotate locations if anyone else is interested in hosting. This new euchre group is open to all adult Muirfield residents. Couples or individuals are welcome! We’re looking for 8 to 12 additional participants. If you are interested in joining the new euchre group and having fun with your Muirfield neighbors, please contact LuAnn Albert directly by email at [email protected]. (The email we sent had an incorrect email address, but this is LuAnn's correct email address.) Please also let her know if you would be willing to host one of the meetings. Mark your calendars… the Muirfield Social Activities Committee is proud to announce that Santa is coming back to town for the annual Brunch with Santa! Bring the kids and grandkids to meet Santa and to enjoy great crafts and a wonderful brunch! Brunch with Santa will be Saturday, December 15, 2018 at The Country Club at Muirfield Village. This event has always been very popular! Last year’s session sold out in 5 hours, so we’ve added a second session to accommodate all who wish to attend. We’re planning on two seatings this year: 9 a.m. - 10:30 a.m. and 11:30 a.m. - 1:00 p.m. Each session can take up to 200 people. The cost will be $16 per adult (ages 12 and up), $13 per child (ages 3 to 11) and $3 per infant (2 and under). Registration will begin sometime in November. Stay tuned to upcoming eNews for more information and a registration link! Make sure to have leaves at the curb by 7 a.m. the Monday of your pickup week. Collections can occur any time between 7 a.m. and 6:30 p.m. on any weekday of the collection week. Rake leaves to the grassy area by the curb; never put leaf piles in the street. Leaf piles will not kill grass! To prevent grass from discoloring, rake your leaves immediately before your scheduled pickup date. Residents can bag leaves in biodegradable bags for weekly curbside yard waste pickup on weeks when the City crews are not doing leaf collection in their neighborhood/zone. Residents are reminded that leaf piles that are mixed with grass trimmings, branches, brush or other non-leaf content will not be collected through this service. Residents with branches, brush, etc. may have them collected through the curbside chipper program. 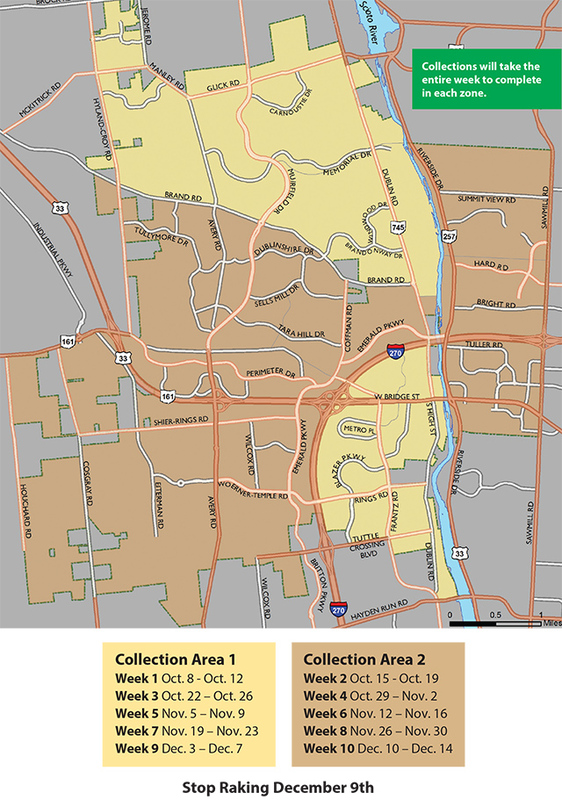 To schedule a chipper collection, call Streets & Utilities’ Information Line at 614.410.4780 (24 hours a day) or the Streets & Utilities office at 614.410.4750 (Monday through Friday, 8 a.m. to 5 p.m.). You can also schedule a curbside chipper collection online using the Service Request Center. Want to know where the leaf collection equipment is? Try LeafGo once collection begins! Bob Fathman, our Board of Directors president, regularly sends emails summarizing what transpired at the latest board meeting, such as the one sent last week. But, in addition to that, did you know that minutes from previous Board of Directors and Grounds and Facilities meetings are in the Members Area? Just log into the Members Area, click on Documents, then Board of Directors Minutes or Grounds and Facilities Minutes. Minutes are posted after they are approved at each Board meeting, which means there can be up to a two month lag between a meeting and the posting of minutes. Minute archives go back to 2013.